For many insect herbivores, maternal host selection is a critical determinant of offspring survival; however, maternal fitness is also affected by adult resources such as food availability. Consequently, adult resources may promote oviposition in sub-optimal locations when measured in terms of offspring performance. 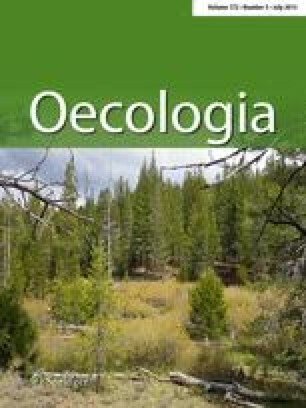 We tested whether oviposition site preference is primarily shaped by proximity to adult food resources or offspring performance in the aspen leaf miner (Phyllocnistis populiella). Quaking aspen (Populus tremuloides) produce extrafloral nectaries (EFNs) on a subset of their leaves. EFN expression on leaves is associated with decreased P. populiella damage and larval performance; however, P. populiella adults feed from EFNs. We reduced extrafloral nectar availability on entire aspen ramets and excluded crawling predators in a full factorial experiment at two sites in interior Alaska, USA. Patterns of egg deposition by P. populiella appeared to be primarily affected by offspring survival rather than adult resource availability. While oviposition was unaffected by nectar availability, adult moths laid fewer eggs on leaves with than without EFNs. By avoiding leaves with EFNs, moths increased offspring survival. Both moths and predators distinguished between leaves with and without EFNs even when nectar and visual cues were obscured, and therefore may respond to chemical cues associated with EFN expression. We extend our gratitude to S. Wilbur for assistance in data collection, D. Sikes for assistance in arthropod identification, and the Life Sciences Informatics program at the Institute of Arctic Biology for computing services. This paper was improved thanks to comments by members of the Iowa State University Plant Group and B. Allman. Funding was provided by a National Science Foundation award (DEB 0543632) to D. Wagner and P. Doak.